Product prices and availability are accurate as of 2019-04-18 02:37:24 EDT and are subject to change. Any price and availability information displayed on http://www.amazon.com/ at the time of purchase will apply to the purchase of this product. 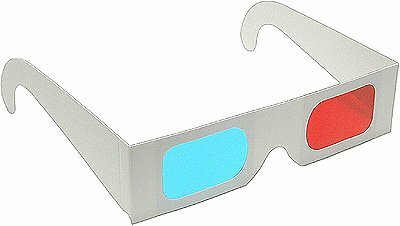 These 3D Glasses Come in Bulk and are very easy to fold. Just fold so Red lens is on the left eye. They come in either White or Yellow Frames, whatever we have in stock. Folds and stores easily and lightweight - Stock Paper Color will be either White or Yellow Used for 3D (Red and CYAN) viewing on internet, DVDs, VHS tapes and broadcast TV (anaglyph) Red and CYAN lenses -- (see other listing for Red and BLUE and Magenta/Green) This listing is for (50) Pair - White or Yellow Frame - Whatever we have in stock Fold them yourself and save!